Editor’s Note: See where this got picked up in the news in over 40 articles at landforgood.org/press. Nearly 30% of New England’s farmers are likely to exit farming in the next 10+ years, and 9 out of 10 of them are farming without a young farmer alongside. This is according to new analysis of U.S. Census of Agriculture data that was part of a study released today by American Farmland Trust (AFT) and Land For Good (LFG). The year-long “Gaining Insights, Gaining Access” study—that also included farmer focus groups—sheds new light on what will be needed to facilitate the transition of farms and farmland in New England to a next generation of farmers. At no point is a farm’s future more at risk than during this transition. 92% of New England’s 10,369 senior farmers do not have a farm operator under age 45 working with them. While this does not mean that these farmers don’t have a succession plan, it suggests that the future of many of these farms is uncertain. Based on focus groups with farmers, the study documents that older farmers are concerned about retirement; especially those farmers without a next generation farmer or owner to take over. Farmers are also unsure about how to find a younger farmer who can afford to buy their land. Many also want help to make sound transfer agreements. According to the study, 30% of New England’s farmers are likely to exit farming over the next 10-20 years. Using Census of Agriculture data (2002, 2007 and 2012), the AFT-LFG study looked at characteristics of farmers in New York and the six New England states, and at both ends of the experience spectrum—those at or beyond retirement age, and those young or new to farming. In all seven states, AFT and LFG conducted focus groups of older farmers who self-identified as having no farm successor. The goal was to learn more about what these farmers are farming and with whom, their vision of retirement, and what challenges they see for the future. As a surprising finding, a significant majority of beginning farmers are also not young: 62% of New England’s beginning farmers are 45 or older. Comparing beginners age 45+ to beginners under age 45, on average older beginners farm slightly less acreage (63 acres compared to 73) and generated less in agricultural sales in 2012 ($23,000 compared to $37,000). The average net farm income for older beginners in 2012 was negative, at –$7,000; for younger beginners, it was a positive $5,000. These findings also have important implications for services and policies needed for beginning farmers. Additional information about the study and a profile of findings from each state can be found on the American Farmland Trust and Land For Good websites, at www.farmland.org/gaininginsights or www.landforgood.org/insights. Gaining Insights, Gaining Access study and findings. In Maine, farmers age 65 and older operate 29% of the state’s farms. Of these 2,367 senior farmers, just 8% of them have someone under age 45 managing the farm with them. The study also found that Maine had 17% fewer young (under 45) farm operators in 2012 than in 2002. Farmers age 65 and older manage 527,000 acres and own a collective $1 billion in land and agricultural infrastructure, much of which may transfer ownership in the next 10-20 years. 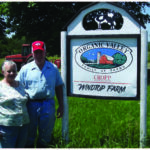 In New Hampshire, farmers age 65 and older operate 30% of the state’s farms. Of these 1,338 senior farmers, just 6% of them have someone under age 45 managing the farm with them. The study also found that New Hampshire had 15% fewer young (under 45) farm operators in 2012 than in 2002. Farmers age 65 and older manage 158,000 acres and own a collective $628 million in land and agricultural infrastructure, much of which may transfer ownership in the next 10-20 years. Read full New Hampshire report. In Vermont, farmers age 65 and older operate 28% of the state’s farms. Of these 2,076 senior farmers, just 9% of them have someone under age 45 managing the farm with them. The study also found that Vermont had 19% fewer young (under age 45) farm operators in 2012 than in 2002. Farmers age 65 and older manage 363,600 acres and own a collective $1.2 billion in land and agricultural infrastructure, much of which may transfer ownership in the next 10-20 years. In Massachusetts, farmers age 65 and older operate 30% of the state’s farms. Of these 2,333 senior farmers, just 8% of them have someone under age 45 managing the farm with them. The study also found that Massachusetts had 16% fewer young (under 45) farm operators in 2012 than in 2002. Farmers age 65 and older manage 184,000 acres and own a collective $1.8 billion in land and agricultural infrastructure, much of which may transfer ownership in the next 10-20 years. In Connecticut, farmers age 65 and older operate 32% of the state’s farms. Of these 1,892 senior farmers, just 7% of them have someone under age 45 managing the farm with them. The study also found that Connecticut had 10% fewer young (under 45) farm operators in 2012 than in 2002. Farmers age 65 and older manage 137,000 acres and own a collective $1.6 billion in land and agricultural infrastructure, much of which may transfer ownership in the next 10-20 years. In Rhode Island, farmers age 65 and older operate 29% of the state’s farms. Of these 363 senior farmers, just 11% of them have someone under age 45 managing the farm with them. The study also found that Rhode Island had a 13% increase in young (under 45) farm operators since 2002, the only state in New England with a net growth in young farmers since 2002. Farmers age 65 and older manage 21,700 acres and own a collective $310 million in land and agricultural infrastructure, much of which may transfer ownership in the next 10-20 years. Read full Rhode Island report. Land For Good has helped hundreds of farmers and farm families find innovative solutions that keep their farms in farming and provide a meaningful legacy. Land For Good works throughout New England to help farmers access and transfer farms and farmland. Farm transfer is a critical issue for thousands of farm families in New England and nationally. Learn more at www.landforgood.org. Land For Good is a leading organization specialized in farmland access, tenure and transfer – and they are on the ground in all New England states. Since 2004, Land For Good has helped hundreds of farmers and farm families find innovative solutions that keep their farms in farming and provide a meaningful legacy. Learn more at www.landforgood.org.